Jamie Carroll from PlayMoreGolf discusses how to build a successful flexible membership category at your golf club. Find out the key elements of a successful scheme, and understand how PlayMoreGolf’s platform allows access to a community of golfers looking for a membership solution that suits their needs. 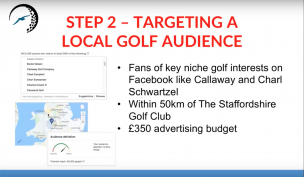 James Wilkinson from Albatross Digital Golf goes through a exact social media lead generation strategy.